After a stressful week of work and wedding planning, and the internet being out at our house, I'm pretty ready for the weekend. 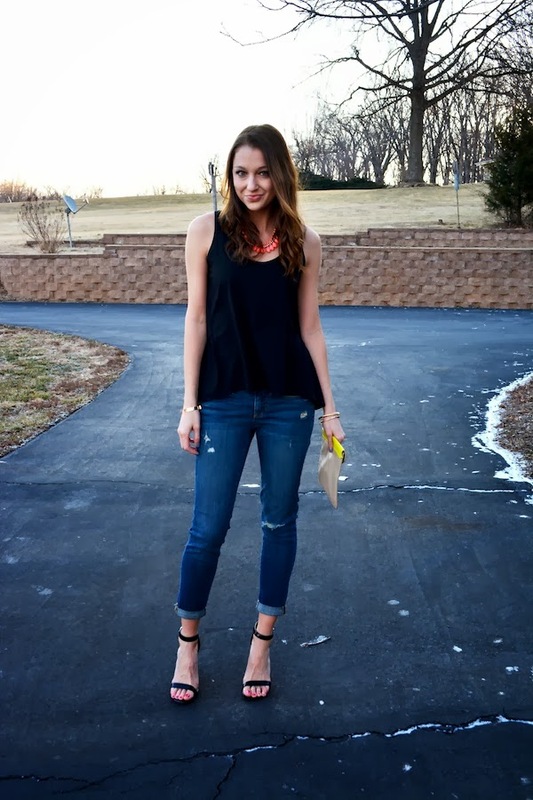 For my third & final boyfriend jeans look this month, I went for simple sophistication! I love this loose peplum top because it's easy to dress up or down, and pretty much goes with everything. The relaxed fit of my top and jeans makes the outfit not overly fancy, which leaves room to add in fun accessories like strappy heels, a statement necklace, and a bright bag. Here are my 3 looks from this month! Which was your favorite? Which look was your favorite?? Super cute and I LOVE your strappy heels! Love all three of these looks!!! Love those heels in the first picture..
Hmmmm it's a toss on which one is my fave between the first and last look. I love the first one because of those heels. They are killer! But I do live in NYC and walk everywhere so the thought of walking more than 5 blocks in that hurts my feet. The first look seems much more comfortable, but still very stylish and fashionable. I think the strappy heels really pull the whole look together! You look incredibly chic and effortlessly stylish, brava. I love all of them but I think the one with the moto jacket is my fave! You look great in each one though - I would definitely rock any one! All of these are fab but I'm loving #1 most-- leather jacket looks amazing with those jeans!